By the 1920s, when amplification made television practical, Scottish inventor John Logie Baird employed the Nipkow disk in his prototype video systems. He created his prototype in a little village called Santa Cruz on the island of Trinidad where he was recovering from an illness. He had also started work on the first color television. On March 25, 1925, Baird gave the first public demonstration of televised silhouette images in motion, at Selfridge's Department Store in London. Since human faces had inadequate contrast to show up on his primitive system, he televised a talking, moving ventriloquist's dummy named "Stooky Bill", whose painted face had higher contrast. By January 26, 1926 he demonstrated the transmission of an image of a face in motion by radio. This is widely regarded as the first television demonstration in history. The subject was Baird's business partner Oliver Hutchinson. Baird's system used the Nipkow disk for both scanning the image and displaying it. A bright light shining through a spinning Nipkow disk set with lenses projected a bright spot of light that swept across the subject. A selenium photoelectric tube detected the light reflected from the subject and converted it into a proportional electrical signal. This was transmitted by AM radio waves to a receiver unit, where the video signal was applied to a neon light behind a second Nipkow disk rotating synchronized with the first. The brightness of the neon lamp was varied in proportion to the brightness of each spot on the image. As each hole in the disk passed by, one scan line of the image was reproduced. Baird's disk had 30 holes, producing an image with only 30 scan lines, just enough to recognize a human face. On December 25, 1925, Kenjiro Takayanagi demonstrated a television system with a 40-line resolution that employed a Nipkow disk scanner and CRT display at Hamamatsu Industrial High School in Japan. This prototype is still on display at the Takayanagi Memorial Museum at Shizuoka University, Hamamatsu Campus. By 1927, Takayanagi improved the resolution to 100 lines, which was unrivaled until 1931. By 1928, he was the first to transmit human faces in halftones. His work had an influence on the later work of Vladimir K. Zworykin. By 1935, Takayanagi had invented the first all-electronic television. His research toward creating a production model was halted by the US after Japan lost World War II. In the mid-1980s Japanese consumer electronics firms forged ahead with the development of HDTV technology, and the MUSE analog format proposed by NHK, a Japanese company, was seen as a pacesetter that threatened to eclipse U.S. electronics companies. Until June 1990, the Japanese MUSE standard—based on an analog system—was the front-runner among the more than 23 different technical concepts under consideration. Then, an American company, General Instrument, demonstrated the feasibility of a digital television signal. This breakthrough was of such significance that the FCC was persuaded to delay its decision on an ATV standard until a digitally based standard could be developed. On November 2, 1936, the BBC began transmitting the world's first public regular high-definition service from the Victorian Alexandra Palace in north London. It therefore claims to be the birthplace of TV broadcasting as we know it today. Television broadcasting in Japan started in August 28, 1953, making the country one of the first in the world with an experimental television service. The first television tests were conducted as early as 1926 using a combined mechanical Nipkow disk and electronic Braun tube system, later switching to an all-electronic system in the 1935 using a domestically developed iconoscope system. In spite of that, because of the beginning of World War II in the Pacific region, this first full-fledged TV broadcast experimentation lasted only a few months. Regular television broadcasts would eventually start in 1953. The first British television broadcast was made by Baird Television's electromechanical system over the BBC radio transmitter in September 1929. Baird provided a limited amount of programming five days a week by 1930. During this time, Southampton earned the distinction of broadcasting the first-ever live television interview, which featured Peggy O'Neil, an actress and singer from Buffalo, New York. On August 22, 1932, BBC launched its own regular service using Baird's 30-line electromechanical system, continuing until September 11, 1935. On November 2, 1936 the BBC began broadcasting a dual-system service, alternating between Marconi-EMI's 405-line standard and Baird's improved 240-line standard, from Alexandra Palace in London, making the BBC Television Service (now BBC One) the UK's first regular high-definition television service. The government, on advice from a special advisory committee, decided that Marconi-EMI's electronic system gave the superior picture, and the Baird system was dropped in February 1937. TV broadcasts in London were on the air an average of four hours daily from 1936 to 1939. There were 12,000 to 15,000 receivers. Some sets in restaurants or bars might have 100 viewers for sport events (Dunlap, p56). The outbreak of the Second World War caused the BBC service to be abruptly suspended on September 1, 1939, at 12:35 pm, after a Mickey Mouse cartoon and test signals were broadcast, so that transmissions could not be used as a beacon to guide enemy aircraft to London. It resumed, again from Alexandra Palace on June 7, 1946 after the end of the war, began with a live programme that opened with the line "Good afternoon everybody. How are you? Do you remember me, Jasmine Bligh?" and was followed by the same Mickey Mouse cartoon broadcast on the last day before the war. At the end of 1947 there were 54,000 licensed television receivers, compared with 44,000 television sets in the United States at that time. The first commercially made electronic televisions with cathode ray tubes were manufactured by Telefunken in Germany in 1934, followed by other makers in France (1936), Britain (1936), and the United States (1938). The cheapest model with a 12-inch (30 cm) screen was $445 (equivalent to $7,736 in 2017). An estimated 19,000 electronic televisions were manufactured in Britain, and about 1,600 in Germany, before World War II. About 7,000–8,000 electronic sets were made in the U.S. before the War Production Board halted manufacture in April 1942, production resuming in August 1945. Television usage in the western world skyrocketed after World War II with the lifting of the manufacturing freeze, war-related technological advances, the drop in television prices caused by mass production, increased leisure time, and additional disposable income. While only 0.5% of U.S. households had a television in 1946, 55.7% had one in 1954, and 90% by 1962. In Britain, there were 15,000 television households in 1947, 1.4 million in 1952, and 15.1 million by 1968. By the late 1960s and early 1970s, color television had come into wide use. In Britain, BBC1, BBC2 and ITV were regularly broadcasting in color by 1969. ↑ Stephens, Mitchell (February 6, 2015). "History of Television". www.nyu.edu. New York University. Retrieved February 6, 2015. ↑ "Giovanni Caselli". Archived from the original on January 15, 2016. 1 2 3 Kenjiro Takayanagi: The Father of Japanese Television, NHK (Japan Broadcasting Corporation), 2002, retrieved 2009-05-23. ↑ "Cathode Ray Tube". Medical Discoveries. Advameg, Inc. 2007. Retrieved 27 April 2008. ↑ Max Dieckmann (1909-07-24). "The problem of television, a partial solution" (PDF). Scientific American, Supplement 1909. 68: 61–62. ↑ Campbell-Swinton, A. A. (1908-06-18). "Distant Electric Vision (first paragraph)". Nature. 78 (2016): 151. doi:10.1038/078151a0. ↑ Campbell-Swinton, A. A. (1908-06-18). "Distant Electric Vision (pdf)" (PDF). Nature. 78 (2016): 151. doi:10.1038/078151a0. ↑ "Distant Electric Vision", The Times (London), Nov. 15, 1911, p. 24b. ↑ Bairdtelevision. "Alan Archivald Campbell-Swinton (1863–1930)". Biography. Retrieved 2010-05-10. ↑ Shiers, George and May (1997), Early television: a bibliographic guide to 1940. New York: Garland, p. 56. Retrieved 2010-06-13. ↑ Campbell-Swinton, A. A. (1926-10-23). "Electric Television (abstract)". Nature. 118 (2973): 590. doi:10.1038/118590a0. ↑ Burns, R. W. (1998). Television: An International History of the Formative Years. The Institute of Electrical Engineers (IEE) (History of Technology Series 22) in association with The Science Museum (UK). p. 123. ISBN 978-0-85296-914-4. ↑ News (1914-04-02). "Prof. G. M. Minchin, F.R.S." Nature. 93 (2318): 115–116. doi:10.1038/093115a0. ↑ Miller, H. and Strange. J. W. (1938-05-02). "The electrical reproduction of images by the photoconductive effect". Proceedings of the Physical Society. 50 (3): 374–384. doi:10.1088/0959-5309/50/3/307. ↑ Iams, H.; Rose, A. (August 1937). "Television Pickup Tubes with Cathode-Ray Beam Scanning". Proceedings of the Institute of Radio Engineers. 25 (8): 1048–1070. doi:10.1109/JRPROC.1937.228423. ↑ Abramson, Albert, Zworykin, Pioneer of Television, p. 16. ↑ "Hungary – Kálmán Tihanyi's 1926 Patent Application 'Radioskop'". Memory of the World. United Nations Educational, Scientific and Cultural Organization (UNESCO). Retrieved 22 February 2008. 1 2 "Patent US2133123 - Television apparatus". Retrieved December 11, 2015. 1 2 "Patent US2158259 - Television apparatus". Retrieved December 11, 2015. ↑ "Vladimir Kosma Zworykin, 1889–1982". Bairdtelevision.com. Retrieved 17 April 2009. 1 2 "Kálmán Tihanyi (1897–1947)", IEC Techline, International Electrotechnical Commission (IEC), 2009-07-15. 1 2 "Kálmán Tihanyi's 1926 Patent Application 'Radioskop'", Memory of the World, United Nations Educational, Scientific and Cultural Organization (UNESCO), 2005, retrieved 2009-01-29. ↑ Tihanyi, Koloman, Improvements in television apparatus. European Patent Office, Patent No. GB313456. Convention date UK application: 1928-06-11, declared void and published: 1930-11-11, retrieved: 2013-04-25. ↑ Postman, Neil, "Philo Farnsworth", The TIME 100: Scientists & Thinkers, TIME.com, 1999-03-29, retrieved 2009-07-28. 1 2 "Philo Taylor Farnsworth (1906–1971)" Archived June 22, 2011, at the Wayback Machine., The Virtual Museum of the City of San Francisco, retrieved 2009-07-15. ↑ Abramson, Albert, Zworykin, Pioneer of Television, p. 226. ↑ The Philo T. and Elma G. Farnsworth Papers Archived April 22, 2008, at the Wayback Machine. ↑ Abramson, Albert, Zworykin, Pioneer of Television, University of Illinois Press, 1995, p. 51. ISBN 0-252-02104-5. ↑ Zworykin, Vladimir K., Television System. Patent No. 2022450, U.S. Patent Office. Filed 1923-12-29, issued 1935-11-26. Retrieved 2010-05-10. ↑ Stashower, Daniel, The Boy Genius and the Mogul: The Untold Story of Television, Broadway Books, 2002, p. 243–244. ISBN 978-0-7679-0759-0. ↑ George Shiers; May Shiers (1997). Early Television A Bibliographic Guide to 1940. Taylor & Francis. p. xii. ISBN 978-0-8240-7782-2. ↑ Abramson, Albert (1987), The History of Television, 1880 to 1941. Jefferson, NC: Albert Abramson. p. 148. ISBN 0-89950-284-9. ↑ Everson, George (1949), The Story of Television, The Life of Philo T. Farnsworth New York: W. W. Norton & Co., ISBN 978-0-405-06042-7, pages 137–141. ↑ Everson, George (1949), The Story of Television, The Life of Philo T. Farnsworth New York: W. W. Norton & Co., ISBN 978-0-405-06042-7, page 139. ↑ Everson, George (1949), The Story of Television, The Life of Philo T. Farnsworth New York: W. W. Norton & Co., ISBN 978-0-405-06042-7, page 141. ↑ "New Television System Uses 'Magnetic Lens'", Popular Mechanics, Dec. 1934, p. 838–839. ↑ Burns, R. W. Television: An international history of the formative years. (1998). IEE History of Technology Series, 22. London: IEE, p. 370. ISBN 0-85296-914-7. ↑ Tedham, William F.; McGee, James D. "Improvements in or relating to cathode ray tubes and the like". Patent No. GB 406,353 (filed May 1932, patented 1934). United Kingdom Intellectual Property Office. Retrieved 2010-02-22. ↑ Tedham, William F.; McGee, James D. "Cathode Ray Tube". Patent No. 2,077,422 (filed in Great Britain 1932, filed in USA 1933, patented 1937). United States Patent Office. Retrieved 2010-01-10. ↑ Burns, R. W., Television: An international history of the formative years. (1998). IEE History of Technology Series, 22. London: IEE, p. 576. ISBN 0-85296-914-7. ↑ Winston, Brian (1986). Misunderstanding media. Harvard University Press. pp. 60–61. ISBN 978-0-674-57663-6. Retrieved 2010-03-09. ↑ Winston, Brian (1998). Media technology and society. A history: from the telegraph to the Internet. Routledge. p. 105. ISBN 978-0-415-14230-4. Retrieved 2010-03-09. 1 2 Alexander, Robert Charles (2000). The inventor of stereo: the life and works of Alan Dower Blumlein. Focal Press. pp. 217–219. ISBN 978-0-240-51628-8. Retrieved 2010-01-10. ↑ Burns, R. W. (2000). The life and times of A D Blumlein. IET. p. 181. ISBN 978-0-85296-773-7. Retrieved 2010-03-05. ↑ Lubszynski, Hans Gerhard; Rodda, Sydney. "Improvements in or relating to television". Patent No. GB 442,666 (filed May 1934, patented 1936). United Kingdom Intellectual Property Office. Retrieved 2010-01-15. ↑ Blumlein, Alan Dower; McGee, James Dwyer. "Improvements in or relating to television transmitting systems". Patent No. GB 446,661 (filed August 1934, patented 1936). United Kingdom Intellectual Property Office. Retrieved 2010-03-09. ↑ McGee, James Dwyer. "Improvements in or relating to television transmitting systems". Patent No. GB 446,664 (filed September 1934, patented 1936). United Kingdom Intellectual Property Office. Retrieved 2010-03-09. ↑ Alexander, Robert Charles (2000). The inventor of stereo: the life and works of Alan Dower Blumlein. Focal Press. p. 216. ISBN 978-0-240-51628-8. Retrieved 2010-01-10. ↑ Inglis, Andrew F. (1990). Behind the tube: a history of broadcasting technology and business. Focal Press. p. 172. ISBN 978-0-240-80043-1. Retrieved 2010-01-15. ↑ Dieckmann, Max and Rudolf Hell. "Lichtelektrische Bildzerlegerröehre für Fernseher". Patent No. DE 450,187 (filed 1925, patented 1927). Deutsches Reich Reichspatentamt. Retrieved 2009-07-28. ↑ Farnsworth, Philo T. "Television System". Patent No. 1,773,980 (filed 1927, patented 1930). United States Patent Office. Retrieved 2009-07-28. ↑ de Vries, M. J.; de Vries, Marc; Cross, Nigel; Grant, Donald P. (1993). Design methodology and relationships with science, Número 71 de NATO ASI series. Springer. p. 222. ISBN 978-0-7923-2191-0. Retrieved 2010-01-15. 1 2 Smith, Harry (July 1953). "Multicon – A new TV camera tube". newspaper article. Early Television Foundation and Museum. Archived from the original on March 18, 2010. Retrieved January 15, 2010. ↑ Gittel, Joachim (2008-10-11). "Spezialröhren". photographic album. Jogis Röhrenbude. Retrieved 2010-01-15. ↑ Early Television Museum. "TV Camera Tubes, German "Super Iconoscope" (1936)". photographic album. Early Television Foundation and Museum. Archived from the original on June 17, 2011. Retrieved January 15, 2010. ↑ Gittel, Joachim (2008-10-11). "FAR-Röhren der Firma Heimann". photographic album. Jogis Röhrenbude. Retrieved 2010-01-15. ↑ Philips (1958). "5854, Image Iconoscope, Philips" (PDF). electronic tube handbook. Philips. Retrieved 2010-01-15. ↑ Everson, George (1949), The Story of Television, The Life of Philo T. Farnsworth New York: W. W. Norton & Co., ISBN 978-0-405-06042-7, page 248. 1 2 Abramson, Albert (1987), The History of Television, 1880 to 1941. Jefferson, NC: Albert Abramson. p. 254. ISBN 0-89950-284-9. ↑ Schatzkin, Paul (2002), The Boy Who Invented Television. Silver Spring, Maryland: Teamcom Books, pp. 187–8. ISBN 1-928791-30-1. ↑ "Go-Ahead Signal Due for Television", The New York Times, April 25, 1941, p. 7. ↑ "An Auspicious Beginning", The New York Times, August 3, 1941, p. X10. 1 2 "On the beginning of broadcast in 625 lines 60 years ago" Archived March 4, 2016, at the Wayback Machine., 625 magazine (in Russian). ↑ "M.I. Krivocheev – an engineer's engineer", EBU Technical Review, Spring 1993. ↑ "In the Vanguard of Television Broadcasting". ↑ Archived July 2, 2007, at the Wayback Machine. ↑ A. Rokhlin, Tak rozhdalos' dal'novidenie (in Russian) Archived April 24, 2013, at the Wayback Machine. ↑ "The World's First High Definition Colour Television System". Retrieved December 11, 2015. ↑ "Patent US2296019 - Chromoscopic adapter for television equipment". Retrieved December 11, 2015. ↑ Peter C. Goldmark, assignor to Columbia Broadcasting System, "Color Television", U.S. Patent 2,480,571, filed Sept. 7, 1940. ↑ "Color Television Achieves Realism", The New York Times, Sept. 5, 1940, p. 18. ↑ "Color Television Success in Test," The New York Times, Aug. 30, 1940, p. 21. "CBS Demonstrates Full Color Television," Wall Street Journal, Sept. 5, 1940, p. 1. "Television Hearing Set," The New York Times, Nov. 13, 1940, p. 26. 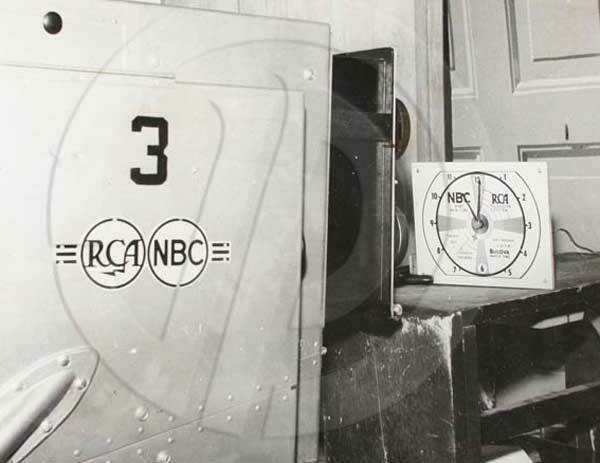 ↑ Ed Reitan, RCA-NBC Color Firsts in Television (commented). ↑ "Making of Radios and Phonographs to End April 22," The New York Times, March 8, 1942, p. 1. "Radio Production Curbs Cover All Combinations," Wall Street Journal, June 3, 1942, p. 4. "WPB Cancels 210 Controls; Radios, Trucks in Full Output," The New York Times, August 21, 1945, p. 1. ↑ Bob Cooper, "Television: The Technology That Changed Our Lives", Early Television Foundation. ↑ "The Origins and Future Prospects of Digital Television". Retrieved December 11, 2015. ↑ "The history and politics of DTV" (PDF). p. 13. ↑ Carmi Levy Special to the Star (October 15, 2010). "Future of television is online and on-demand". Toronto Star. Retrieved January 17, 2012. ↑ Jeremy Toeman 41 (October 20, 2010). "Why Connected TVs Will Be About the Content, Not the Apps". Mashable.com. Retrieved January 17, 2012. ↑ "Internet TV and The Death of Cable TV, really". Techcrunch.com. October 24, 2010. Retrieved January 17, 2012. ↑ "espacenet – Original document". Worldwide.espacenet.com. Retrieved January 17, 2012. ↑ "espacenet – Bibliographic data". Worldwide.espacenet.com. Retrieved January 17, 2012. ↑ Dieter Bohn (January 6, 2015). "All of Sony's new smart TVs run on Android TV". The Verge. Vox Media. Retrieved December 11, 2015. ↑ "CES 2015: New Samsung Smart TVs Will Be Powered by Tizen OS". Tech Times. Retrieved December 11, 2015. ↑ "LG to show off webOS 2.0 smart TV at CES 2015". CNET. CBS Interactive. December 18, 2014. Retrieved December 11, 2015. ↑ "How Stereoscopic Television is Shown". Baird Television website. Retrieved 18 September 2010. ↑ laurence marcus. "THE HISTORY OF THE BBC: THE FIRST TV ERA". Retrieved December 11, 2015. ↑ Burton Paulu. "British Broadcasting in Transition". ↑ "50 years of Eurovision", EBU, January, 2004. ↑ ""Can you see me clearly?" Public TV image reception experiment (1939)". NHK. May 13, 1939. Archived from the original on January 1, 2013. Retrieved November 11, 2012. ↑ Kenjiro Takayanagi: The Father of Japanese Television Archived June 4, 2002, at the Wayback Machine.. Retrieved 2012-11-01. 1 2 3 "Participation of A.Raspletin in developing and realization of black-and-white television standards". ↑ Hawley, Chris, "Peggy O'Neil sang her way from the Hydraulics to stardom", The Hydraulics [blog], January 15, 2009. 1 2 "The edit that rewrote history – Baird". Transdiffusion Broadcasting System. October 31, 2005. Archived from the original on January 25, 2006. Retrieved May 28, 2007. 1 2 Shagawat, Robert. "Television recording – The origins and earliest surviving live TV broadcast recordings". Early Electronic Television. Early Television Museum. Retrieved April 20, 2011. ↑ "Human Faces Sent By Radio 3000 Miles Across The Sea". Evening Independent. Associated Press. February 9, 1928. p. 1. Retrieved July 15, 2011. ↑ "What Television Offers You", Popular Mechanics, November 1928, p. 823. ↑ "The Latest in Television", Popular Mechanics, September 1929, p. 472. ↑ "WRNY to Start Daily Television Broadcasts; Radio Audience Will See Studio Artist", The New York Times, August 13, 1928, p. 13. ↑ "WRNY Has Extended Television Schedule", The New York Times, September 30, 1928, p. 155. ↑ "Television Drama Shown With Music", The New York Times, August 22, 1928, p. 1. ↑ The Queen's Messenger, Early Television Museum. ↑ "Television Placed on Daily Schedule", The New York Times, March 22, 1929, p. 30. ↑ "Six Visual Stations on the New York Air", The New York Times, July 19, 1931, p. XX13. ↑ "Radio Talkies Put On Program Basis", The New York Times, April 27, 1931, p. 26. ↑ CBS considers it to be an ancestor of WCBS-TV, which first went on the air on July 1, 1941 as one of the first two commercially licensed television stations in the country (the other being the National Broadcasting Company's WNBC). ↑ W6XAO later moved to VHF Channel 1 before World War II, and to Channel 2 in the post-war television realignment. It was commercially licensed in 1947 as KTSL and is the direct ancestor of current station KCBS-TV. 1 2 Alexander B. Magoun, Television: The Life Story of a Technology. Greenwood, p. 65. ISBN 978-0313331282. ↑ "Where Is Television Now? ", Popular Mechanics, August 1938, p. 178. ↑ "Telecasts Here and Abroad", The New York Times, Drama-Screen-Radio section, April 24, 1938, p.10. ↑ "Early Birds", Time, June 13, 1938. ↑ "Telecasts to Be Resumed", The New York Times, Drama-Screen-Radio section, Aug. 21, 1938, p. 10. ↑ Robert L. Pickering, "Eight Years of Television in California", California — Magazine of the Pacific, June 1939. ↑ "Imagery For Profit" R. W. Stewart, The New York Times, July 6, 1941. ↑ Antipolis, Sophia (September 1997). Digital Video Broadcasting (DVB); Implementation of Binary Phase Shift Keying (BPSK) modulation in DVB satellite transmission systems (PDF) (Report). European Telecommunications Standards Institute. pp. 1–7. TR 101 198. Retrieved 20 July 2014. ↑ "Frequency letter bands". Microwaves101.com. 25 April 2008. 1 2 "Installing Consumer-Owned Antennas and Satellite Dishes". FCC. Retrieved 2008-11-21. ↑ Campbell, Dennis; Cotter, Susan (1998). Copyright Infringement. Kluwer Law International. ISBN 90-247-3002-3. Retrieved 18 September 2014. ↑ Campbell, Richard; Martin, Christopher R.; Fabos, Bettina (23 February 2011). Media and Culture: An Introduction to Mass Communication. London, UK: Macmillan Publishers. p. 152. ISBN 978-1457628313. Retrieved 15 August 2014. ↑ "The 1945 Proposal by Arthur C. Clarke for Geostationary Satellite Communications". Retrieved December 11, 2015. ↑ Wireless technologies and the national information infrastructure. DIANE Publishing. September 1995. p. 138. ISBN 0160481805. Retrieved 15 August 2014. 1 2 Klein, Christopher (23 July 2012). "The Birth of Satellite TV, 50 Years Ago". History.com. History Channel. Retrieved 5 June 2014. ↑ "Relay 1". NASA.gov. NASA. ↑ Darcey, RJ (16 August 2013). "Syncom 2". NASA.gov. NASA. Retrieved 5 June 2014. ↑ "Encyclopedia Astronautica - Intelsat I". Archived from the original on January 16, 2010. Retrieved April 5, 2010. ↑ "Soviet-bloc Research in Geophysics, Astronomy, and Space" (Press release). Springfield Virginia: U.S. Joint Publications Research Service. 1970. p. 60. Retrieved 16 December 2014. 1 2 "История создания советского спутникового телевещания". Retrieved 3 January 2017. ↑ Robertson, Lloyd (1972-11-09). "Anik A1 launching: bridging the gap". CBC English TV. Retrieved 2007-01-25. ↑ Ezell, Linda N. (22 January 2010). "NASA - ATS". Nasa.gov. NASA. Retrieved 1 July 2014. ↑ Wade, Mark. "Gorizont". Encyclopedia Astronautica. Archived from the original on June 17, 2008. Retrieved June 29, 2008. ↑ "Ekran". Astronautix.com. Astronautix. 2007. Archived from the original on November 12, 2013. Retrieved July 1, 2014. ↑ Feder, Barnaby J. (15 November 2002). "Taylor Howard, 70, Pioneer In Satellite TV for the Home". The New York Times. Retrieved 19 July 2014. ↑ The "Glory Days" of Satellite Archived March 3, 2014, at the Wayback Machine. ↑ Browne, Ray (2001). The Guide to United States Popular Culture. Madison, Wisconsin: Popular Press. p. 706. ISBN 9780879728212. Retrieved 1 July 2014. ↑ Giarrusso, Michael (28 July 1996). "Tiny Satellite Dishes Sprout in Rural Areas". Los Angeles Times. Los Angeles: Los Angeles Times. Retrieved 1 July 2014. ↑ Keating, Stephen (1999). "Stealing Free TV, Part 2". The Denver Post. Denver, CO: The Denver Post. Retrieved 3 July 2014. ↑ Stein, Joe (1989-01-24). "Whatta dish : Home satellite reception a TV turn-on". Evening Tribune. p. C-8. ↑ "Earth Station Is Very Popular Dish". Reading Eagle. Kansas City, Missouri. 21 December 1980. Retrieved 21 July 2014. 1 2 3 4 Brooks, Andree (10 October 1993). "Old satellite dish restrictions under fire New laws urged for smaller models". The Baltimore Sun. Baltimore, MD: The Baltimore Sun. Retrieved 1 July 2014. 1 2 Nye, Doug (14 January 1990). "SATELLITE DISHES SURVIVE GREAT SCRAMBLE OF 1980S". Deseret News. Salt Lake City: Deseret News. Retrieved 30 June 2014. 1 2 3 Stecklow, Steve (1984-07-07). "America's Favorite Dish". The Miami Herald. Knight-Ridder News Service. p. 1C. ↑ Reibstein, Larry (1981-09-27). "Watching TV Via Satellite Is Their Dish". The Philadelphia Inquirer. p. E01. 1 2 3 Dawidziak, Mark (1984-12-30). "Satellite TV Dishes Getting Good Reception". Akron Beacon-Journal. p. F-1. 1 2 "Broadband Cable 10th Anniversary". TinyPic. Retrieved 5 May 2013. 1 2 "Industry History". sbca.com. Satellite Broadcasting and Communications Association. 2014. Archived from the original on February 19, 2014. Retrieved June 5, 2014. ↑ Stecklow, Steve (1984-10-25). "Research Needed in Buying Dish: High Cost Is Important Consideration for Consumer". Wichita Eagle. Knight-Ridder News Service. p. 6C. 1 2 3 4 5 Takiff, Jonathan (1987-05-22). "Satellite TV Skies Brighten As War With Programmers Ends". Chicago Tribune. Knight-Ridder Newspapers. Retrieved 2014-04-10. ↑ Wolf, Ron (1985-01-20). "Direct-Broadcast TV Is Still Not Turned On". The Philadelphia Inquirer. p. C01. 1 2 3 Lyman, Rick; Borowski, Neill (April 29, 1986). "On The Trail Of 'Captain Midnight'". Philly. Retrieved May 20, 2014. 1 2 Paradise, Paul R. (1 January 1999). Trademark Counterfeiting, Product Piracy, and the Billion Dollar Threat to the U.S. Economy. Westport, Connecticut: Greenwood Publishing Group. p. 147. ISBN 1567202500. Retrieved 3 July 2014. 1 2 3 "Scrambled NBC Bad News for Satellite Pirates". San Francisco Chronicle. United Press International. 1988-11-03. p. E3. 1 2 "Cable Television Consumer Protection and Competition Act of 1992". Article STATUTE-106-Pg1460.pdf, Act No. 1460 of 8 October 1992 (PDF). Retrieved 3 July 2014. 1 2 "ASTRA 1A Satellite details 1988-109B NORAD 19688". N2YO. 9 July 2014. Retrieved 12 July 2014. 1 2 Grant, August E. Communication Technology Update (10th ed.). Taylor & Francis. p. 87. ISBN 978-0-240-81475-9. ↑ Bell-Jones, Robin; Berbner, Jochen; Chai, Jianfeng; Farstad, Thomas; Pham, Minh (June 2001). "High Technology Strategy and Entrepreneurship" (PDF). INSEAD journal. Fontainebleau: INSEAD. Archived from the original (PDF) on July 24, 2014. ↑ Mirabito, M.,& Morgenstern, B. (2004). Satellites: Operations and Applications. The New Communication Technologies (fifth edition). Burlington: Focal Press. 1 2 Khaplil, Vidya R.; Bhalachandra, Anjali R. (April 2008). Advances in Recent Trends in Communication and Networks. New Delhi: Allied Publishers. p. 119. ISBN 1466651709. Retrieved 16 July 2014. ↑ "Rain fade: satellite TV signal and adverse weather". Dish-cable.com. Dish-cable.com. 2010. Retrieved 16 July 2014. ↑ Pre-1935 Baird Sets: UK, that produced a red postage-stamp size image, enlarged to twice that size by a magnifying glass. The Televisor sold in 1930–1933 is considered the Television History: The First 75 Years. ↑ "Britain's oldest colour telly 'still going strong' 42 years on, says 69-year-old owner". Daily Mail. London. November 11, 2010. History of television – Includes a systematic collection of early texts on "seeing at a distance by electricity"